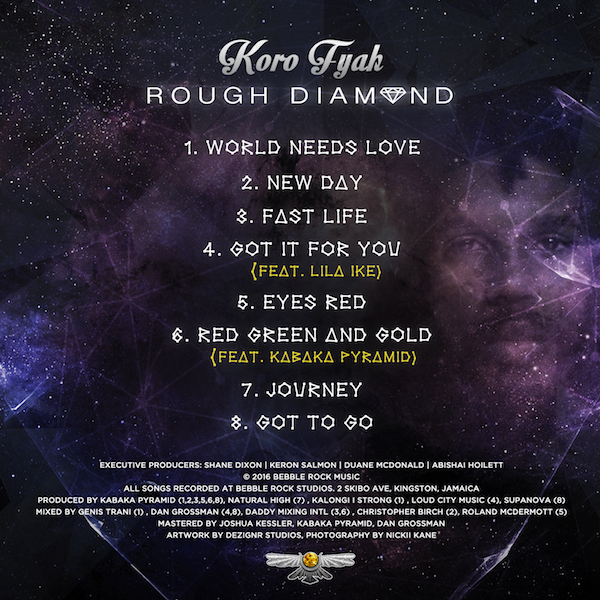 The colliery of Bebble Rock Music has mined a new treasure: Koro Fyah is the name of the up and coming artist who presents his sparkling debut EP Rough Diamond. Eight tracks have been composed, recorded and refined in the little Bebble Rock Studio close to Half Way Tree Road in Kingston, carefully cut and polished by the skilled hands of Duane McDonald, Abishai Hoilett and Keron Salmon himself. The latter, better know by his artist name Kabaka Pyramid, not only gave Shane Dixon aka Koro Fyah the opportunity to introduce himself extensively on stages all over Europe during the summer, but also lent his voice to one of the songs: Red Green And Gold, a repatriation hymn calling all "real Ethiopians". The second feature, interesting as well, is Got It For You. Another young singer on the rise, Lila Ike joins Koro on a lover's rock riddim to tell her sweetheart what she's got in store for him. Before the artist turns to these personal love stories, however, he addresses a more universal issue. Opening track World Needs Love is an emotional acoustic plea for unity and love. Picking up speed, in comes New Day, Koro's first official single in 2014 and a proof that already back then, the singer's productions were serious business – check the arrangement and these angelic backing vocals! His next single release was the Ganja-tune Eyes Red in 2015, including an accompanying video directed by Pierce "Daddy P" McClean and Andrew Jackson. Attention, catchy tune: Fast Life urges us to slow down and take it easy in these crazy times. I swear this song calls for a video too, the script for which seems to unfold while listening to the beat and the lyrics. Journey encourages us to "lift your head to the sky, spread your wings and fly" on a nyabinghi-introduced riddim produced by Kingston's Natural High Music. 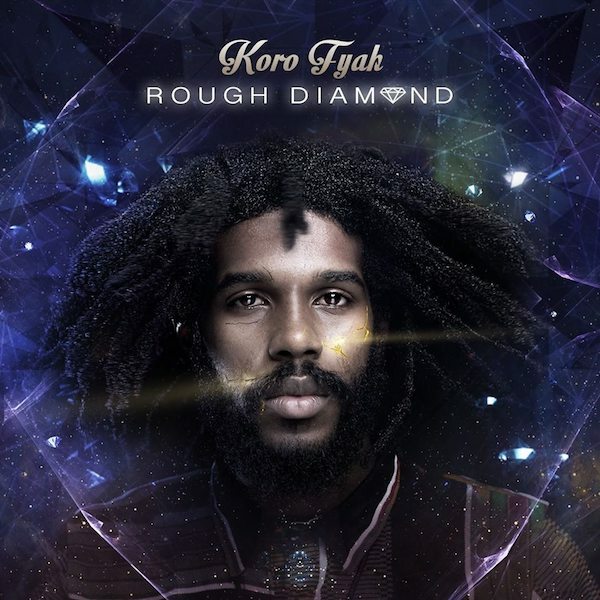 A calm and proper way to bid his listeners farewell, Got To Go relies on piano, drums and background vocals alone in the beginning, giving Koro Fyah's voice plenty room to fill (so much, in fact, that his potential to mature further becomes obvious), and gathers momentum along the way. Rounded off by the awe-inspiring artwork of photographer Nickii Kane and Dezignr Studios, the release is a pleasure for your senses. Bring this Rough Diamond to shine! Allow it to come into play on your headphones, speakers or soundsystems. Explaining the album title and the decision to make it available as free download, the artist says: "Working with the Bebble Rock team to create this project has been a rewarding journey. I have learned and grown over the time it took to create, and just as it takes time and pressure to refine a diamond, so too did this project. We are finally ready to deliver it to the people and we intend to make it as accessible as possible."